All new lip gloss from Attitude is enriched with Vitamin E that helps nourish your lips while giving them a long lasting glossy shine. So, get your shade now and flaunt your Attitude. I’m not a big fan of lip glosses mainly because they have a low staying power. I’ve always preferred lipsticks. Be it college or work. Due to my busy work schedule I do not get time for touchups and therefore I prefer long lasting matte lipsticks rather than lip glosses which do not last for more than 2 hours. It’s been almost three years since I’ve last used a lip gloss! 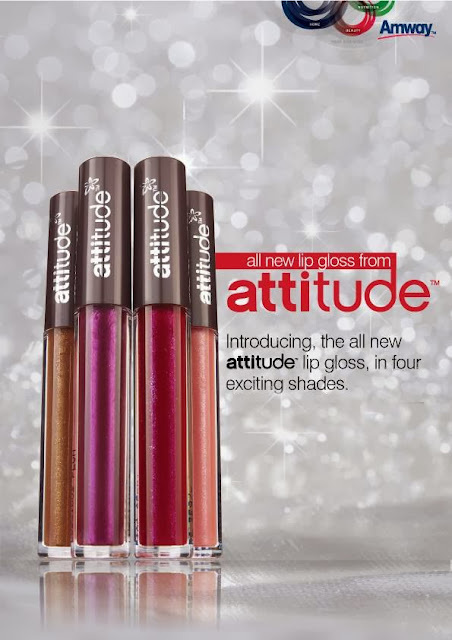 But when Attitude launched four new lip glosses recently I had to buy atleast one just to try it out. Out of the four shades I chose pink berry. So here is my take on the product. The packaging is simple and pretty. The gloss has a mild fragrance. You won’t notice it unless to smell it closely. The shade is rightly named as pink berry. It is a pink coloured gloss having berry undertones. This shade will suit all skin tones. Just one swipe gives rich colour and covers up lip pigmentation. Two swipes will give a dark look which I personally don’t prefer. As for the staying power, this lip gloss lasts on my lips for around 2 hours and as it dries, it leaves behind a lovely pink tint which looks even better than freshly applied. The tint stays on for another hour or so. I love it! This lip gloss is not sticky at all. Full marks for this! Even when it dries up I do not feel any stickiness. Nothing bad to say about this product. I will be using this lip gloss whenever I got out for a shorter period. One day I decided to wear this lip gloss over a lipstick. The shade Rose Love from Attitude itself is a bit similar to this Berry Pink shade. So I wore this gloss once over the Rose Love shade and it looks quite good. You should be a little careful here in the sense if you are using this lip gloss over a lipstick you need to use very little gloss just for that extra shine. Please do not go overboard with this gloss be it alone or over a lipstick. I feel this lip gloss is reasonably priced as you need very little at a time and thus it will last long.